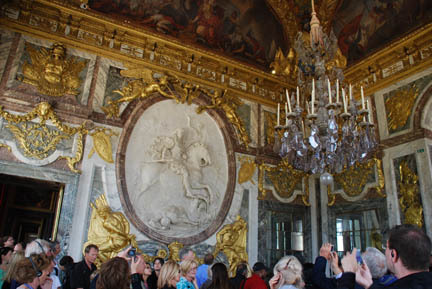 Versailles is about 15 km. from Paris and we arrived quickly on the motorway. This is the back side of the king's house, the front is covered in scaffolding and tarps. And when I turned around this was the view. A huge fountain with gardens to each side, a long lawn and then a canal-like lake a kilometer long that had a crossing lake of matching size making a huge cross of water. You can see the vertical of the water cross a kilometer away in the distance. King Louis XIV decided he didn't like living in Paris any longer and had this built for himself and the court. About 20,000 people lived here, servants, courtiers wannabe's, etc. It was used by successive kings and even by Napoleon after the French revolution. We stood in line for 45 minutes to get tickets and then looked at the line into the palace, it was two hours long. We went into the gardens first. There are at least a thousand acres of gardens, fountains, grass, woods and "small" hide-away places called Trianons. We walked straight down the center to the main lake. 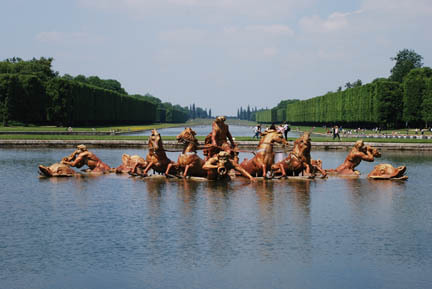 Just as you get to it there is this fountain of a chariot, four horses and some buglers riding on fish. (It turns out that the fountains are only running on weekends and we are there on Tuesday.) The base of the cross shaped lake is on the other side of the fountain. Off to the right about a half kilometer are the "Grand Trianon" and the "Petit Trianon". These are small palaces where the King (Grand) and his mistress Mme. de Pompadour (Petit) could get away from it all. 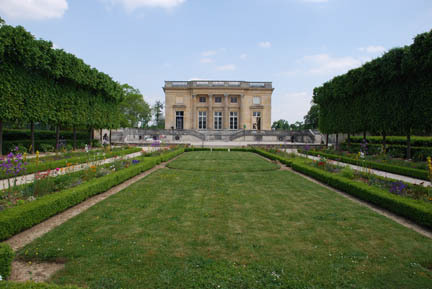 This is the King's Grand Trianon. When Marie-Antoinette lived in Versailles she told King Louie XV that she wanted to return to the natural life of a village and farm. So Louie built her a village and farm near the Petit Trianon to satisfier her. She had several buildings just for her own use, including a separate building for sleeping and dressing and a billiard room too. The white two-story building to the right of center is the billiard room. Billiards was very popular with the court, but I wonder how many other French villages of the period had billiard halls. After the gardens and the Trianons we walked back to the palace. It is now about 16:00 (4 o'clock in the afternoon for you Americans) and the line is gone. We have two hours to closing, plenty of time. 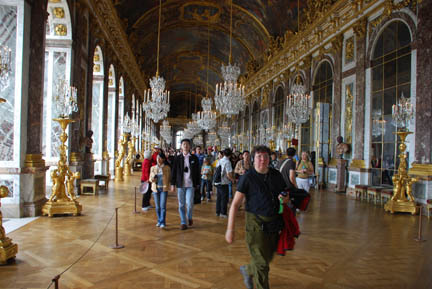 This is the famous "Hall of Mirrors" where the Treaty of Versailles was signed ending WW I. 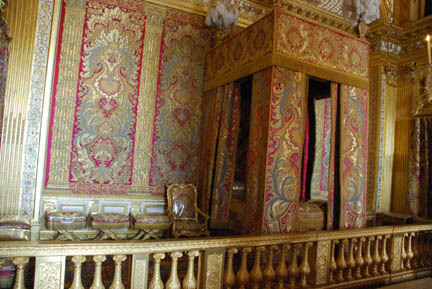 The king's bedroom when he is not hiding out at his Trianon. It's been very interesting. We have seen a lot of things we have read about, seen on TV, and studied in school. Seeing the real one is nothing like seeing it in a picture. There is no way here to show how huge the Eiffel Tower really is. You can look at the picture and see the people like ants at the base, but standing under it and looking up is very different. Our next destination is the German GoldWing Treffen in Gieselwind, Germany by way of the Champagne area of France.